Golf carts are a common sight along the Grand strand these days, and not just on the area’s many golf courses. Permanent residents and visitors alike can be seen buzzing about in golf carts, headed to the beach, to dinner, to the grocery store, or for a spin around the neighborhood to see what’s going on. Golf carts are perfectly suited to the slower lifestyle found at Myrtle Beach and along the Grand Strand. Not only do golf carts save gas, they’re also a good excuse to breathe the salty air – even if it’s for just a quick trip to the ice cream parlor or the grocery store. 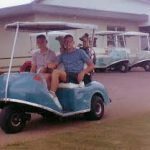 The first motorized golf carts appeared in Myrtle Beach in 1951, a post-war product made possible by batteries originally designed to power wing flaps on B-17 bombers. In the seventy years since their debut, those handy self-powered carts have made their ways off the golf course and onto suburban streets, subdivisions, gated communities, and just about any other paved surface. Visitors and residents alike often use golf carts to go shopping, visit the beach and go to the store. Golf carts are great for loading up the beach towels and cooler for a day trip to the beach or just to pick up some fresh fish from the local seafood market. It’s also a good idea to make sure that all of the paperwork and permits are in place. Golf carts regularly appear on police blotters as inebriated golf cart drivers plow these low-speed vehicles into walls, fences, trees and homes. So it’s wise to use the same good judgment driving a golf cart as driving an automobile. While many communities allow the golf carts to drive to the beach, most also allow the use of carts to visit grocery stores, pharmacies, and restaurants. Many golf cart owners spend more time on the cart than in their car! There are a few communities that do not allow golf carts on the property, so a home buyer interested in owning a golf cart should check with their Trembley Group Real Estate Sales Executive for guidance. Currently, in areas where golf carts are allowed, they carts are allowed under the following circumstances. Some communities may have more restrictive regulations as well, so check with a sales executive for details on specific areas. Golf carts are still only allowed to be driven during daylight hours. To ensure safe operation of golf carts, the cart should not carry any more passengers than it is designed for. A golf cart is a vehicle and therefore subject to the same laws that govern the operation of an automobile up on a public street. Anyone interested in trying a golf cart before making the leap and purchasing one can rent a golf cart at many of the cart rentals along the grand strand. Carts can be rented online and many rental agencies will even deliver.